These are the M1892 bugles on which all modern bugles are based. They are usually marked Regulation Bugle or with a manufacturer’s name. For many years these instruments were manufactured by King, C.G. Conn, Buescher, York, Holton, Ludwig, Millard, and Weymann. These horns are quite easy to find on internet auction sites and are still manufactured. A company called Buglecraft was making them for a long time and selling them under Rexcraft an Rex and US Regulation. Recently a company called Regulation Bugle started selling the M1892 pattern They can be found HERE I do not believe the instruments sold by this company are made in the US. The bugles are in the key of G which is pitched lower than modern trumpets so it is easier to sound all the notes. The problem is that these horns are mostly of cheap construction and play rather poorly. The term US Regulation does not imply it was manufactured in the US. It simply means it is of the US regulation (the specification of 1892). Better quality ones were made during the 1930s or 40s by instrument companies like Conn, Wurlitzer, Holton or Ludwig. 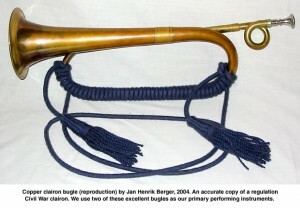 This is the most common type of bugle used in the Civil War. It is a big-belled instrument that is in the key of C but can be lowered to B flat with the use of a crook. There are good modern reproductions made by Amati and Andrew Naumann. There are also hundreds of French-made (Coueson) instruments that are period correct. The Amati andFrench-made models are in the key of B flat. They can be found on internet auction sites and at relic shows. 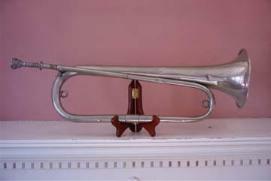 This is the M1894 bugle in B flat, also referred to as a “Trench” bugle. These small WWI triple twist bugles can be found without much problem on internet auction sites and at antique or relics shows. They are identified by the writing on the bell which marks the manufacturer, specification number (Spec. 1152), and date of production. They have no tuning slides and the pitch is not consistent between horns. This is a double twist bugle in B flat. They were introduced in England in 1855 but the model they are based on can be traced back to 1810. This is the model that all Civil War sutler (“Gunga Din”) bugles are based on . These horns were probably not used during the Civil War and there are no known pictures of a musician with one during that period. This is the cheap Pakistan or Indian made instrument. Civil War sutlers sell them with a USA or CSA marking on them and also with crossed sabers and a “7” and “A.” There are no known photos of a Civil War bugler with one of these horns. The sounding of Taps on a field trumpet or bugle rather than a valved trumpet or cornet has a long and proud tradition. With the number of U.S. veteran funerals rising and a need for live buglers increasing, many trumpet players have been searching for an adequate instrument on which to sound Taps. The style of bugles (outside of the drum and bugle corps movement, which added valves to their instruments) has changed little since the introduction of the M1892 Field Trumpet by the US Army. The M1892 Field Trumpet (also called a bugle) was the main signal instrument for the U.S. military and was adopted by various organizations such as the American Legion, V.F.W. and Boy Scouts. These field trumpets are in the key of G and many are made of poor quality. The US Army Band (“Pershing’s Own”) has, for almost fifty years, used a B flat bugle (signal trumpet) Bach Stradivarius model made by the Vincent Bach and later Selmer Corporation. These bugles are based on the M1892 model but pitched in the key of B flat and made to higher specifications than commercially available bugles. 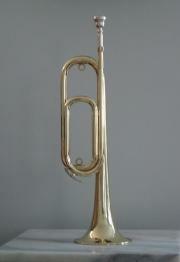 The original Bach bugles were gold plated and the second batch manufactured were lacquered. Two original ones are on display; one at the Army Band Building at Fort Myer, the second in the Visitor Center at Arlington National Cemetery. The latter is, of course, the famous “Kennedy Bugle.” All the bugles have been used to sound Taps at the Tomb of the Unknowns at Arlington as well as the many simple honor funerals at the cemetery. For years Selmer has refused many official and private requests to manufacture any additional bugles past the original twenty or so they made for the band in the 1960s. In 2007, Bach produced about two dozen gold plated bugles to update the US Army Band’s inventory. A few of them made their way into private hands. For the longest time there was no American-based company making a good quality bugle for ceremonial use. 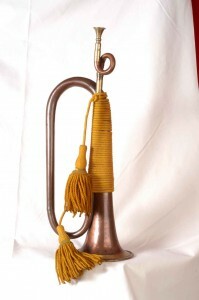 In the spring of 2003, following a news article about a refurbishing of a bugle for a West Virginia Air National Guard Honor Guard bugler, the Getzen instrument manufacturing company was approached with the idea of producing a ceremonial bugle for use at funerals and ceremonies. The new Getzen American Heritage Field Trumpet (named by Jari Villanueva) is pitched in B flat, made of the finest brass, with a medium large bore. The bugle has a tuning slide, water key and two tabard rings. The American Heritage is a free blowing horn without any of the resistance found in the valve tubing found on regular trumpets. The intonation is superb throughout. It is a double twist horn measuring 16 inches from bell to shank with a 5 inch diameter bell. The bore size is .459. The American Heritage Field Trumpet also has an extra slide to lower the pitch into G. This addition came after many players expressed the desire to have a G horn instead of B Flat. Also, after a long process to acquire a replacement bugle for use, the US Army Band in 2002 decided on using bugles manufactured by Stomvi. They were modeled on the 1892 pattern, had two water keys, a tuning slide and two cord rings. 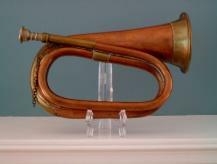 The horn is sixteen inches in length (without mouthpiece) and has a five inch bell diameter. It is pitched in B flat and is gold plated. In 2007 after some use at Arlington National Cemetery, these horns were taken out of service when Bach produced new bugles. The Getzen and Kanstul instruments are bugles that would be appropriate to sound Taps at a funeral or to bugle at a ceremony. I know that there are many trumpeters in police and fire honor guards throughout the country who are looking for a good B flat bugle to use rather than a valved trumpet. 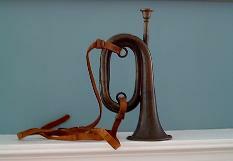 The regulation G (Boy Scout) bugle and the “Gunga Din” bugle just do not cut it for intonation and beauty of sound. This entry was posted on Monday, May 31st, 2010 at 4:47 pm	and is filed under Buglers Through History, Bugles for Performing and Collecting, General Interest, Getting Started on the Bugle, History of the Bugle, Jari's Articles, News. You can follow any responses to this entry through the RSS 2.0 feed. You can leave a response, or trackback from your own site. Interesting to know the history of the official Bugles. Heard your remarks on a you-tube about J.P. Sousa music. (last time I performed with them) use Mr. Sousa’s music. What an amazing man he was. I have heard the recorded bugle played at military funerals, and when I commented to a VFW friend at how poor I thought it was and that it was kind of disgraceful, not truly honoring the deceased, I was told that it was just fine. In addition, when I said I would be honored to play taps any time it was needed at a funeral, I was told that I would not be allowed to do so, because I was not a veteran. I was very surprised at this and really do not understand why civilians are not allowed to honor our veterans. Can anyone shed any light on this subject. I am retired USAR, served two tours in Middle East. I have attended a couple of Military Funerals with Full Honors where a fake trumpet recorder was used to play TAPS while it was raining. The Trumpet recorder intermittently faded and broken sound crackled. It was a disgraceful representation of the meaning of TAPS, it was also a dishonorable service to the service member memory and the family. I thought to myself what if I were to learn to play the real traditional bugle and perform TAPS for such Military Funerals for Service members and Veterans etc.. I am 53 and willing to learn and provide this service when needed at no cost. Call it Veteran who still serves his country. How do I contact for TAPS to be played at a Military funeral n NY, Pa, & SC? I have a question regarding the qualifications of an instrument whether it would be suitable for taps. It’s for my city’s 100th anniversary of the Firefighter Relief Association that’s taking place on Firefighter Sunday in June. I would like to play a traditional bugle for this occasion but the best that i could get is a 2 valved flugelhorn bugle created by Dynasty, circa mid 1980s. Would this be an acceptable bugle for the ceremony?